Once complete, it will occupy a space larger than the Great Pyramids of Giza and rise taller than St. Paul's Cathedral. It's called the Mastaba — a 150 meter (500 feet) tall flat-topped pyramidal structure that was just approved for construction by Abu Dhabi officials. Designed by acclaimed artist Christo, the colossal monument will cost $340 million to build and, perhaps most striking of all, it will be made from over 410,000 multi-colored oil barrels. 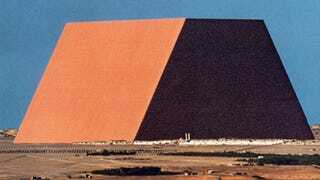 The stacked oil barrels will be painted in colors inspired by the yellow and red sands of the desert — what Christo says will recreate the visual effect of an Islamic mosaic. Speaking to the Observer, he said: "When the sun rises, the vertical wall will become almost full of gold." It's estimated that Mastaba, which will be constructed in the desert about 100 miles from Abu Dhabi City, will take 30 months to build and require hundreds of workers. The structure will be accompanied by an "art campus" with an exhibition about the project, as well as a luxury hotel and restaurant. Abu Dhabi officials are hoping to attract up to 2 million visitors each year. Christo, who came up with the design 30 years ago, insists that it's not a pyramid, and that the name and geometrical form were inspired by an ancient Mesopotamian mud bench for desert travellers to rest. The idea, says Christo, is to create a sculpture that's rooted in the great tradition of Islamic architecture. He also denies that the oil barrels are a kind of social commentary on the region, noting his 1960s "Iron Curtain" exhibit that blocked off a Paris street with oil drums. Christo insists that his ideas have nothing to do with economic or political events, and are instead, in the words of Jeanne-Claude, works of "joy and beauty."